CARMEL, IN – Join us this Saturday, December 8, from 4-6 p.m. as the City of Carmel and AAA Insurance present the inaugural Carmel Holiday PorchFest, a musical holiday celebration that will span two hours across two city blocks in the beautiful Arts & Design District neighborhood north of Main Street. Listen to the sounds of the Dickens Carolers, who will be performing in authentic 19th Century costumes, and Another Round, an Indiana University all-male a capella group; local pianist Jack Kirkland; and the versatile, acoustic band RDJO, all while strolling through the street, keeping warm by the fire pits and listening to the music played from District porches or from the roaming holiday carolers. Make sure you also enjoy the free treats at a special “S’mores Station” manned by AAA Insurance; a special holiday beer recipe brewed by Union Brewery; a glass of wine from Peace Water Winery; or hot chocolate, coffee and other holiday treats served by Market District. Holiday PorchFest will take place along 2nd Avenue NE from 3rd Street NE to 5th Street NE. 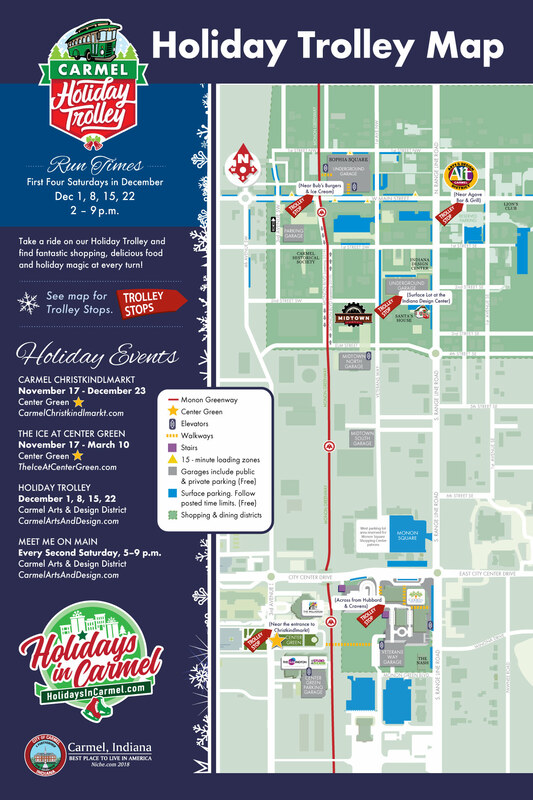 There is plenty of parking nearby, but the Carmel Holiday Trolley will also be running that day and will be able to drop you off a block away so you and your family can join in the fun. Follow this link for a schedule of stops for the Holiday Trolley. Residents in the neighborhood will be competing for “Best Holiday decorated porch,” the winner of which will receive a $100 gift card to Anthony’s Chop House. PorchFest Board members will serve as judges and determine the winner. The timing is perfect, as well, to enjoy the IU Health North Second Saturday Gallery Walk taking place among the galleries, shops and restaurants through the District from 5-9 p.m. Saturday. Thanks to the City’s rotating Holiday Trolley, it will also be possible to enjoy other exciting destination point, such as Carmel City Center, the Carmel Christkindlmarkt and the Ice at Center Green. Dress warm, bring your friends and family and make a day of it in beautiful Carmel, Indiana, where we celebrate the holidays all month long!